But before we start let me explain what Indian Made Foreign Liquor (IMFL) is first and how it differs from whiskies we know... IMFL refers to hard liquors produced in India other than "indigenous alcoholic beverages" or spirits produced in foreign countries and imported to India to be bottled. Although any type of raw material can be used to distill the base spirit, molasses are the most common ingredient used in India. It is distilled to a level as high as 96% abv which qualifies it actually as neutral grain spirit and then reduced to 42.8% abv (75 imperial proof) as required by law before it can be adulterated with flavoring and coloring agents. At this point actually it might be blended with imported spirits such as rum or Scotch whisky to enhance the flavor profile or not at all. 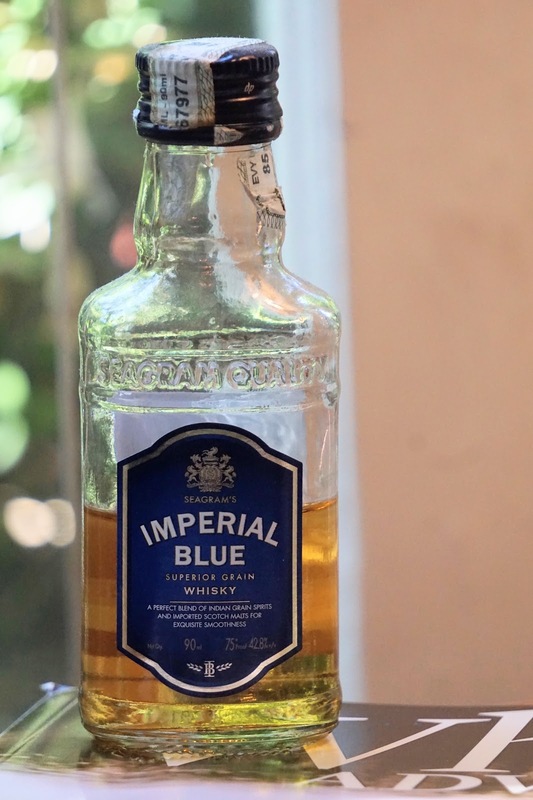 So, that being said let's pour some Imperial Blue and start our tasting from number three through number one of world's top three selling whisky brands. Color: Medium amber with thin but surprisingly persistent legs. Nose: Well, almost nothing... Odd. Maybe very faint thin lemon juice at the back but mostly rubbing alcohol and plastic bottles. That's about it. Palate: Young alcohol... A little caramel, lemon juice and artificial sweetener. Finish: Short with not so much fun alcohol burn on the lips and at the back of your throat. Overall: I have to admit that I was expecting a way more offensive product but it actually doesn't nose or taste like anything in particular. Yes, the alcohol is very straightforward but it tastes more like a very cheap lemon flavored vodka. At the end it really didn't cause a lot of damage... Let's see what the other two will taste like. Thanks again to Susannah Skiver Barton for the sample.